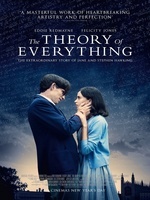 This film is adapted from Jane Wilde Hawking's book, "Traveling To Infinity: My Life with Stephen". Background on Stephen Hawking at Wikipedia. My Life with Stephen – blog post at Not Even Wrong which summarizes key points of the marriage. Unfortunately, the blog post linked above is much more interesting than the movie. It felt too watered-down, too polished. It felt like a PR piece for both parties. The movie didn't have any great insights to Hawking's work or theories, either. The weak narrative made it feel longer than it was, too. It was a letdown for me. I adored this movie -- it's probably best viewed as a somewhat melodramatic, yet oddly cheerful tale about the way a marriage changes over time and under strain, rather than, say, a piece that has something to share about Hawking radiation and the like. Redmayne's and Jones' performances exceed all of the hype. And I have fallen in love again with the actor Harry Lloyd (as Brian, his roommate). There is something about the beautiful lighting in this film - the images of 1963 Cambridge seemed surreal, in the best way. I felt truly transported. Did not believe Emily Watson is old enough to play Jane's mother. Goodness. Knowing nothing in advance about the Hawkings' actual marriage, I found the big reveal devastating. I enjoyed this film; yes it probably glossed over some of the nastier aspects of their lives (didn't the family of Stephen Hawking treat Jane Hawking rather shabbily? I thought that was well-known and kind of a given, we didn't see too much of that in the film but we got a taste of it), and I'm sure it was sort of blown-up caricature but I really liked the portrayal of Jane, and they gave the actress a plum scene at the kitchen dinner table (particle vs. quantum) which must've been loads of fun to play using the dinner potatoes as illustrations, thought that was rather clever. Really interesting details of living with this disability (the scene of pulling yourself up the stairs, having to sleep sitting up, the whole prone-to-sudden-choking thing - how horrendous), and also the directorial decision of how to portray an epiphany in Hawking's mind was incredibly well-done (when he's stuck with his sweater over his head and he can see the fire through the knitting). Yeah, so really enjoyed this. This felt a lot more honest than The Imitation Game, which was the other Big Worthy British Biopic at the time. I suspect as an adaptation of Jane's book she comes off looking a lot better than he does. (He's obtuse, socially inept, crotchety and resigned at his diagnosis, Brilliant Difficult Scientist; she's the long-suffering Good Woman that he needs but does not fully appreciate.) But at the same time it didn't shy away from showing that living with severe disability is wearing for both partners. Eddie Redmayne was terrific in this and totally disappeared into the physicality of the transformation. If anything Felicity Jones had a harder job to do playing against him: hers is a quieter, stiller performance that could easily have been overshadowed but wasn't. Hrrrm and yeeees, it was, and sometimes science is about those incidental hey-wait-a-minute ideas. But in general cinema doesn't do very well at showing science -- particularly theory -- as it's actually done. Notice that this movie does at one point fall into the trope of "brilliant scientist furiously chalking equations on blackboard." It's a lot rarer to see the many more attempts that don't pan out; the managing your notes and references and scribblings; the daily and weekly routine of coffee breaks and casual discussion with fellows and uneventful, non-fireworky, dull even, seminars; the tedium of preparing and submitting and revising papers; worrying about grants and funding; and more than anything the sheer volume of reading of papers and proceedings and preprints. A lot of that's not cinematic, but it is interesting in Hawking's case that he was able to continue to participate and produce in the scientific community despite the difficulties his disability causes -- if anything the movie greatly understates the significance of his assistants and nurses in enabling his work. Finally, a couple of exposition-ey moments briefly threw me out of the movie. Firstly, the clunky way his supervisor invites him to a talk by "the mathematician, Roger Penrose": that description is entirely for the audience, both the characters would know full well who Penrose is. Secondly, Stephen explaining to Brian that motor neurone disease is "Lou Gehrig's disease; he was a baseball player" is entirely about providing a reference for American audiences; it's not known by that name at all in the UK.